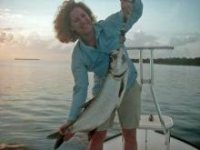 Sight Fish Charters - Florida Keys Flats Fising Videos: Tarpon, permit bonefish snook, cudas and shark. Filmed fishing with friends in the Lower Florida Keys. 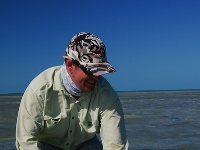 No sunsets, clouds, birds, talking about why we like to fish, etc.. Just 10 solid minutes of non stop flats fishing action.... "Keys Style"
The weather and the fishing had been excellent this Nov. . Water temperatures in the mid 70's and light winds. Lots of big permit on the gulf edge along with some tanker sized cudas. My friend Bo asked me to show him were I had been getting the permit... 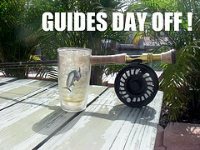 I call it PERMITOPIA..
March is considered to be the best month to fly fish for permit in the lower Florida Keys. 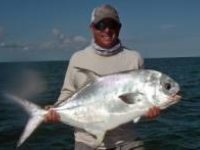 This March is no exception, lots of permit on the flats and the gulf edge. 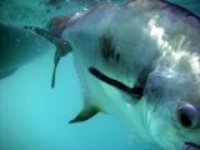 Recently I had the privilege of fishing with my friend Capt. Kevin Guerrin. It is rare that we both have the same days off.. We each hooked a permit on fly.. 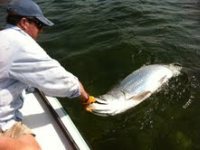 However Kevin boated his..
Kelsey catches a nice tarpon on a gurgler.. Kelsey and Mike Ward from Craig Mt. came down to the keys to fish with me for a couple of days in late Augustt. Mike and Kelsey run Fishy Expeditions in Craig Mt. My charter cancelled on a cold, windy day in February. I called two fishing buddies, both Montana fly Fishing Outfitters. 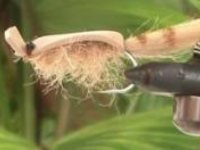 Water temperatures were low, we knew the fish would be sluggish and opted throw live bait instead of flies.. 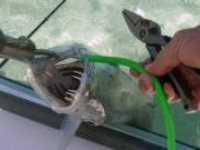 Rob throws tube lures at barracuda on the flats... While I try and film from the poling platform. Two Swiss boys try hard to get'm. This fall, I had the pleasure of fishing with Dan and Dan from Switzerland.. They got here for our first "cold front". Fishing was a little tougher then it could have been.. 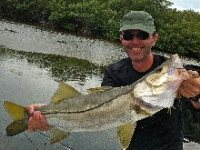 But we fed some tarpon, boated jacks, sharks and a very nice snook. 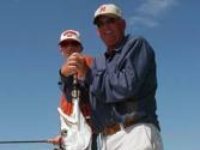 They did an excellent job fishing and filming..
Steve brought his 12 year old grandson Jaxon down to the Keys for his first ever salt water fishing trip.. Might be his first but certainly not his last.. Jaxon had a blast sight fishing to sharks.. First day, first shark was a 7 foot blacktip hooked in less then 3 foot of water.. It was fun..
Mike and Rich made a video from our day on the water. Mike boated a tarpon on fly and Rich got a big shark.. Fun day!